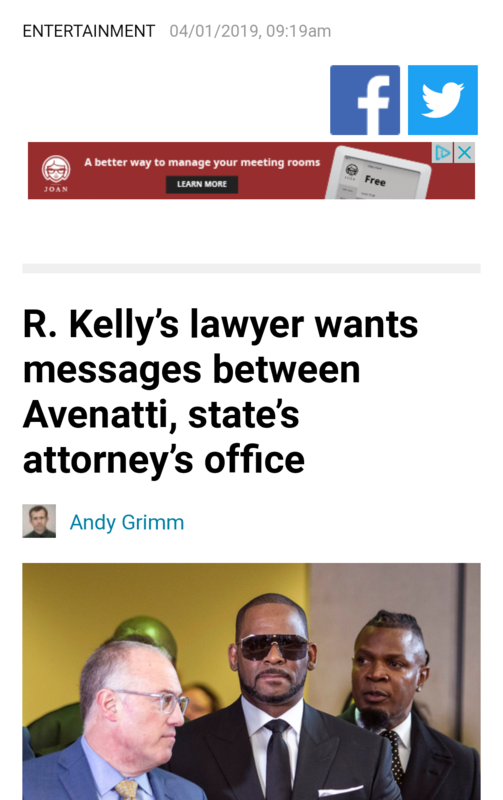 R. Kelly’s lawyer has demanded law enforcement officials preserve all communications between Cook County prosecutors and embattled celebrity attorney Michael Avenatti. Citing concern over Avenatti’s recent indictment for allegedly attempting to extort millions from Nike and referencing State’s Attorney Kim Foxx’s handling of charges against “Empire” actor Jussie Smollett, defense attorney Steve Greenberg, filed a motion that requires prosecutors, police and the state’s witnesses to save their communications with Avenatti. Talking to reporters after a brief hearing on Monday, Greenberg said the prosecutors’ case against Kelly appear to lean heavily on accusations leveled by Avenatti and the women he is representing. Avenatti’s extortion case has shown “how he operates,” Greenberg said. Like just how many of these cases AND people are connected? I watched Leaving Neverland and After Neverland. Has anyone seen them? Really worth watching. Anyhow that was Geragos too. He's a handler, Oprah's a handler. It's all just so incredibly creepy and twisted. The tangled web and Oprah kept repeating, this isn't about Michael Jackson but it's about our whole world and what's happening right now. Paraphrasing. So many connections of all of these people. One messed up big family. The tangled web and Oprah kept repeating, this isn't about Michael Jackson but it's about our whole world and what's happening right now. Paraphrasing. It's some soft disclosure. Damage control, look who produced it. She is NOT good people. We already have automated UpisDown, LeftisRight and both (Revolve) in Magic Square functionality but I can see that we need another version where the lines retain their original length rather than wrap within a magic square. c) Words Left to Right = reverse order of words on all lines. Why?..He hasn't done a damn thing for NY..Nothing.. Why is it so important that he remains in power? as his little brother (Chris) keeps spewing total BS across the airwaves? This article made me spit my coffee. ATLANTA (AP) — Oprah Winfrey says she's not interested in a presidential bid despite Democrats' continuing buzz about the billionaire media icon. Winfrey tells InStyle magazine in a newly published interview that she hears the encouragement but doesn't "have the DNA" for a White House run. She says she's "very secure and confident" in her life already. I wouldn't tinker with your formula at all, I am just wondering, in the future proves past aspect of it all, that it may be that simple. The future proving the past would be a mirror no? Future could be a Reflection of the past, or a Mirror, or a Looking Glass... wish we had tied down definitions for what each of these mean!